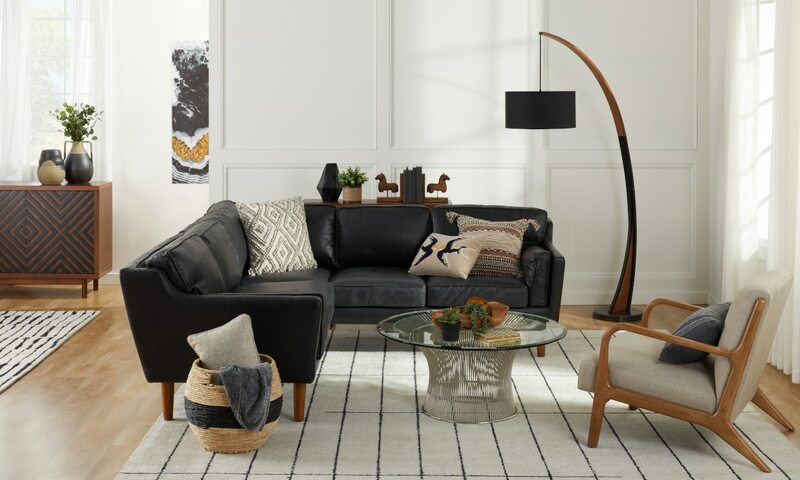 To add more drama to your living room decor, bring in the big guns: a solid black sectional with nailhead trim for something classic, a shimmering black chaise to lend a colonial vibe, a world-wise black swing chair for the free spirit, or edgy black bar stools for the cosmopolitan. 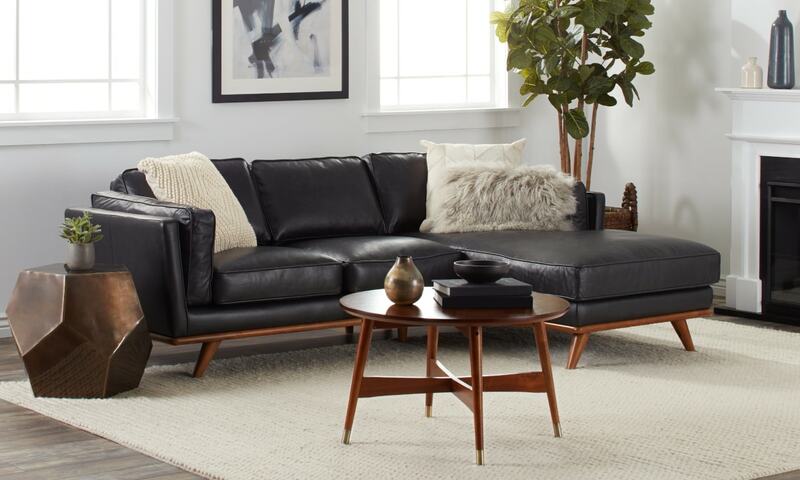 Whether it’s plumped or stiff-backed and made from masculine leather or smooth velvet, choose black furniture that suits your style. If you want just a touch of black in your living room seating, consider styling a chic, multifunctional piece like a bench or ottoman. When you’re decorating with black furniture in the living room, it’s easy to quickly muscle out your other decor with a large fixture like an entertainment center. But mid-level pieces are better for balancing your living room’s palette. Pepper in black furniture throughout your room with a punchy bar cart, a tasteful end table, or a classic console. A black finish can be extremely versatile. For example, a coffee table with wrought iron legs lends itself to rustic, farmhouse, and industrial styles. Even if your taste in decor changes over the years, you won’t have to get rid of your favorite pieces of black furniture. Show off your favorite knick-knacks with a subtle black bookshelf. 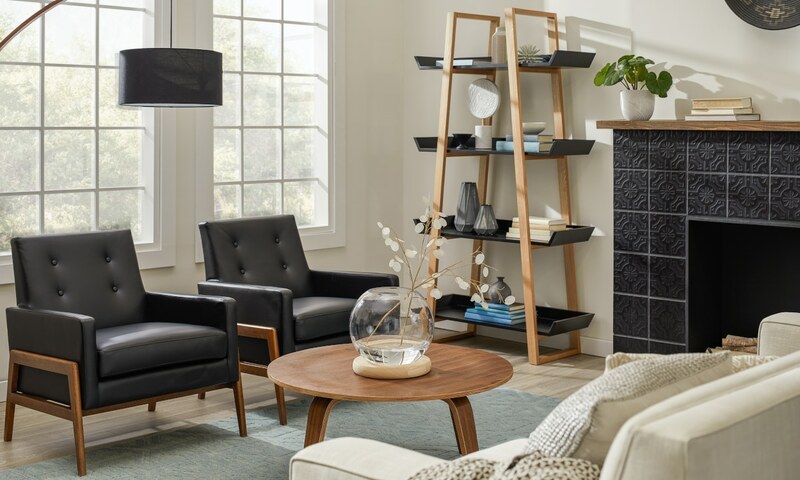 Whether you choose a trendy leaning or ladder shelf, an airy etagere, or a simple floating ledge, this high-contrast look will leave your living room feeling fresh and modern. Metallic accents pair especially well with black furniture, so display them on your bookshelf to make it stand out even more. 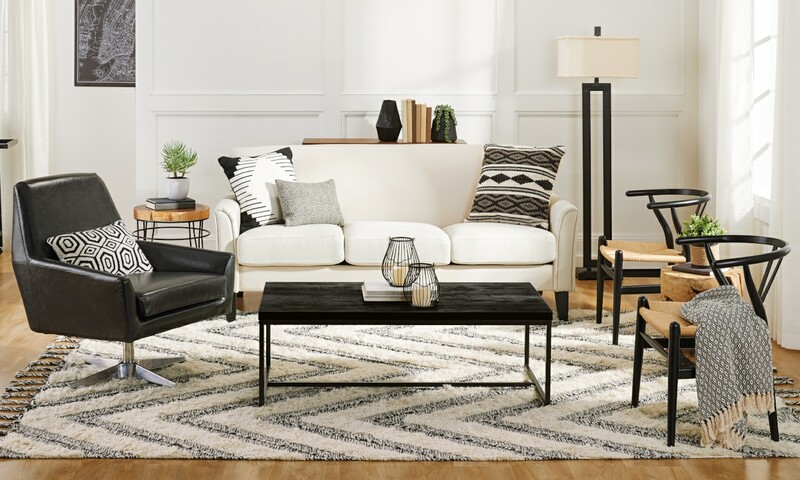 Transform the look of your living room furniture with a black rug. 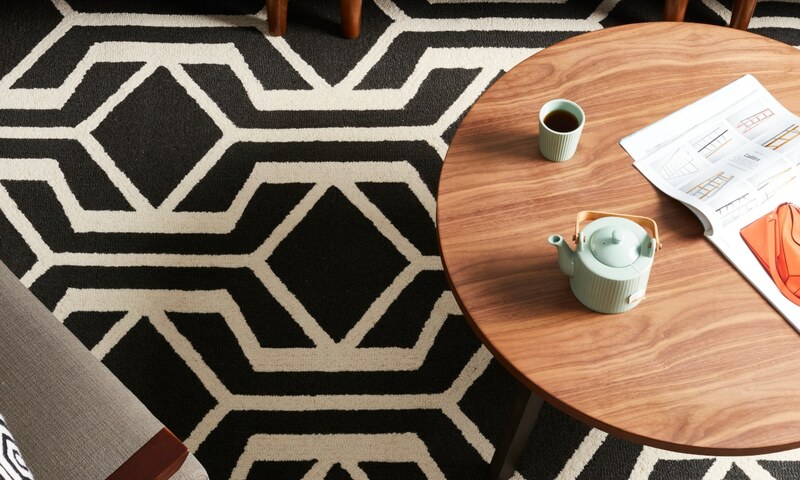 Solid or patterned, a black rug will always look clever, complex, and contemporary. Throw down a luxurious shag rug to turn your living room into a glamorous haven. 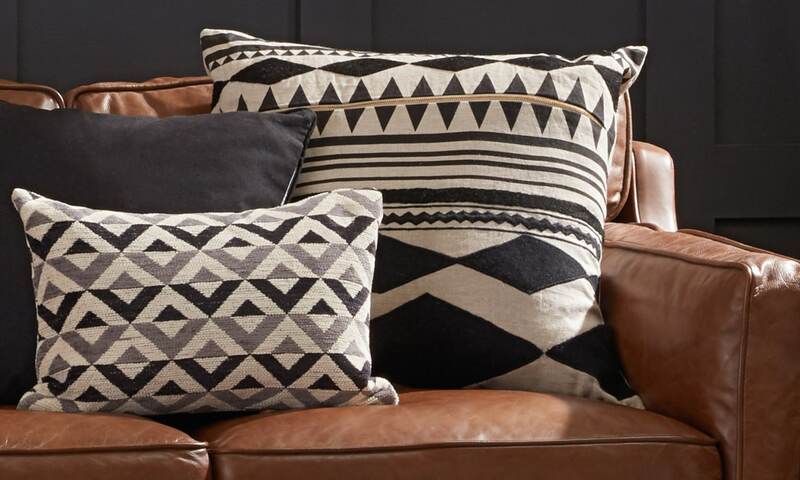 Or bring in a geometric flatweave for a boho or Southwestern motif. Whatever your style, a black rug can help your living room look its best while also covering up stains and wear. When decorating with black, you don’t have to limit yourself to furniture. 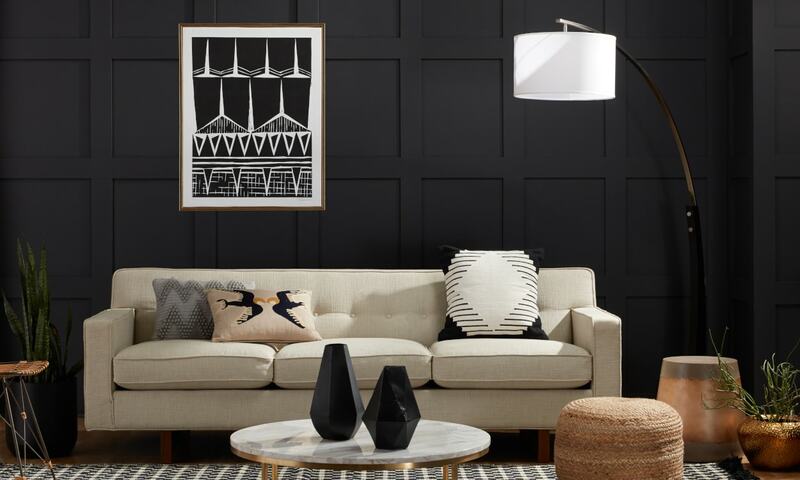 For a truly dynamic spin on the black living room, double up on trends with a monochromatic gallery wall or one big modern art installation. Try a few whimsical black-and-white prints of wildlife or a one-of-a-kind vintage photograph to start conversations and dress up your walls. Larger pieces like couches and chairs can feel like they take up most of your living room. If you need to be mindful of how much space you have, try matte black accents instead. Hints of flat black in planters, pillows, baskets, curtains, or lamps can lighten the look while adding a little texture and interest. When dark colors are spread evenly throughout a room, the contrast they create will be more impactful. Looking to add the matte black furniture trend to other rooms in your home? Read our guide on How to Decorate a Bedroom With Black Furniture.